Let's try to create the most inhospitable outdoor dining situation imaginable and see if anyone comes. First, let's pick the largest city in the United States, New York, to make sure we have potential for congestion. Second, pick one of the busiest thoroughfares in Manhattan - Houston Street, so it's like eating on a super highway. Third, we make sure we choose a really crowded area to insure opportunity for the maximum numbers of passersby. Fourth, while we're at it, provide no separation between diners and those passersby, guaranteeing a complete lack of privacy. Fifth, let's use inexpensive, plastic chairs (the kind you get for a few dollars at a discount shop) so the experience feels really cheap. Sixth, make sure we have a garbage can nearby filled with trash. And in a fluorescent orange traffic cone for color. Seventh, let's put some of the tables around the corner next to the kitchen exhaust system for those who really want more ambiance. So there you have it. 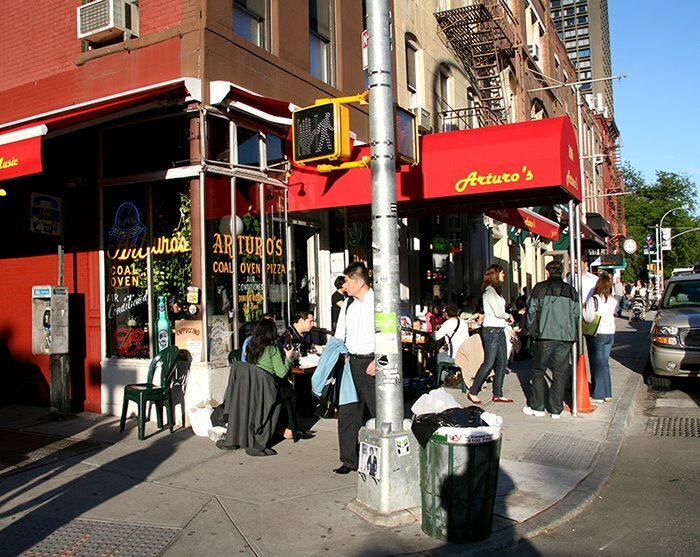 Dining al fresco at Arturo's, New York City style. And do we get any customers? You bet, and there are no tables available.